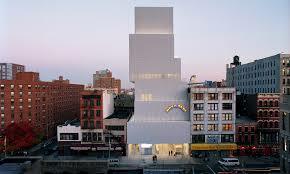 The New Museum of Contemporary Art, founded in 1977, is the premier contemporary art museum in New York City and among the most important internationally. The Museum exhibits innovative contemporary art from around the world, and offers public programs, a unique bookstore, and an extensive web site. The New Museum, down the block from the Guggenheim Soho, is a stone building with intricately carved columns and arches over big, sunny floor to ceiling windows. It blends in perfectly with the rest architecture in the area. The gallery space is a long narrow room that has been divided up into several smaller cubicle-like spaces. The dividing walls, along with the wide columns that punctuate the gallery, make for an unusual effect. Although individual rooms feel quite small, the number of rooms makes the gallery seem to go on, somewhat like a maze, for a while. The type of artwork on display at the New Museum is the very unusual, abstract art that is just about impossible for an ordinary person to understand. This museum is geared towards people with a serious interest in contemporary art who have studied it enough to be able to penetrate the odd styles and symbolism used in the art on display. You can see the museum quite well in an hour or two.